We left Dunedin this morning to head south into an area called the Catlins - and area of destinctive ridges, native forests, headlands, sandy beaches and home to some amazing rare wildlife. Its also the furthest south you can go in The south island. Curio bay is not a schedualed overnight stop, but having read up on this area Tom and I decided to stay a couple of nights here as it sound like our kind of thing. The bus stopped along the way to see some wildlife and some stunning views. One of the stops was Kaka point where we walked along the beach to see about 12 huge sealions on the shore. There was nothing seperating them from us. We could get as close as we liked - which wasn't too close - these things could take ur arm off. Curio bay was a spot of pure isolation. There are no shops, internet cafes or bars here. Just a few houses and hostels. Our hostel was also a surf school and was right on the seafront. 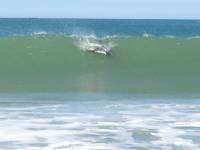 One of the rare animals living here is the hector dolphin. 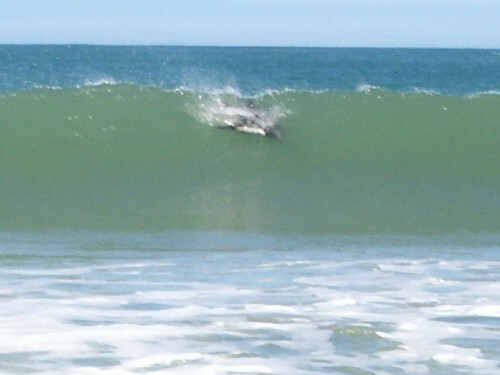 They love shallow water and played in the bay all day long - jumping out of the water or riding the surf in groups. You could get right in and swim with them for free. The other rare animal this area homes are the yellow eyed penguins. These are harder to spot. We went over to the bay just before sunset to stake out. We waited and waited. I was beginning to get flash-backs of beaver watching but sure enough eventually one popped out of the ocean to begin its journey across the beach to its nest at the back. They were in no kind of hurry and were comical to watch - Stepping a bit, then jumping with both feet, then hobbling like old men. They took a couple of hours to get right across the beach. One did get fairly close before the light faded. So we saw two of the worlds rarest creatures in one day - not bad going. The next day we went surfing. Tom was much further out than me and had dolphins circling around him. I managed to stand up a couple of times but don't think im improving at all! In the evening we took a walk to the campsite to the supply shop. Only to bump into another sealion. We spoke to the ranger and it turns out its made its home there, right in the carpark. It was the cutest thing ever and the most random. It seemed to be loving all the attention - posing for the cameras. The ranger told us not to trust the cuteness - he'd seen it kill a dog! On the last day we decided to take the 6km costal walk to the next town - Waikawa. Where we were told we could use the internet and get fish and chips. Tom spotted a huge brown mound high up on the beach. Turned out it was another sealion. I thought it was dead at first - then it moved. It was amazing just to bump into one like that. We left the beach and headed up the estuary towards Waikawa. Before we knew it the sand had turned to sticky mud. We were up to our ankles, losing our flip-flops whils crabs were scuttering around our feet. In the end we had to succumb to it and squelch bare-foot to safety. I was in hysterics, as you can imagine. When we finally made it to the town, mud up to the eyeballs, the fish and chip shop was closed on Mondays. Gutted. We left Curio bay in the afternoon and headed to Invercargill - Once called by one of the rolling stones, excuse this mum...."the d*** of the world."